Is this lass really one of the good guys? Kirisame Marisa blasts her way through any obstacle. "Magic is all about prettiness and power, zeh!" As hardworking as intransigent, she's in your library stealing your books before you know it. Blink and your precious spellcards are gone (borrowed), the magic ready to be adapted to Marisa's own purposes through laborious sessions of trial and error - unlike the illusionary creatures of Gensokyo, she's just an ordinary western magician and has to put in effort for her beams of seven-colored destruction to work. Marisa's instinctive reaction to hearing of the donation box theft at the local shrine is claiming she didn't do it. That's despite her not even being a suspect. She's not thrilled about the prospect of helping out with the search for the stolen item - time spent investigating is time she can't devote to her own mischief. What gets her motivated is the threat of some risque endeavors of hers getting exposed by another search party member. 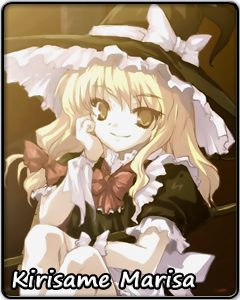 Marisa's quirky behavior and habits are well-known throughout Gensokyo. Nevertheless, lack of friends is not something she can complain about - Gensokyo's shrine maiden suffers the presence of this freeloader witch, the reclusive librarian of the Scarlet Devil Mansion never improves her security measures and the ever-harried puppeteer living next door allows herself to be dragged into perilous adventures time and time again. It might be that Marisa is just good company. Or maybe, as Marisa would say, it's the power of love. Zeh.